To access the admin page, please create a Tomcat user with an admin role by defining this user in tomcat-users.xml. Please refer to the Realm Configuration section in the Tomcat documentation for more details. The above prerequisite items are installed and running on the same machine. Create a new DB user corvus with password corvus. Repeat steps 2b - 2d for the ebms database. 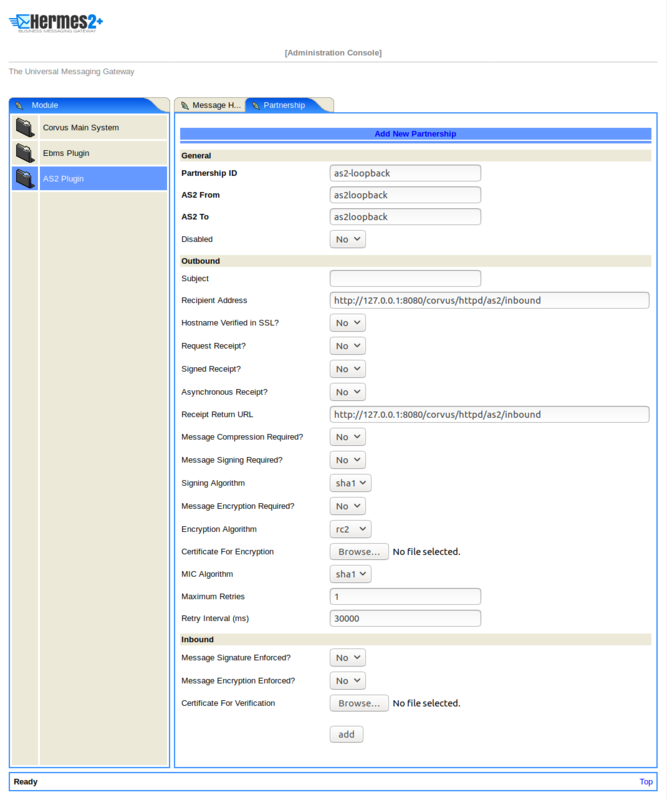 Repeat steps 1e – 1f for the ebms database. 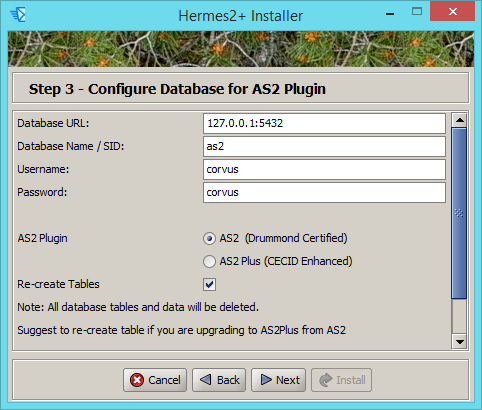 Press Enter until you get to Screen in 3.2 Configure Hermes. 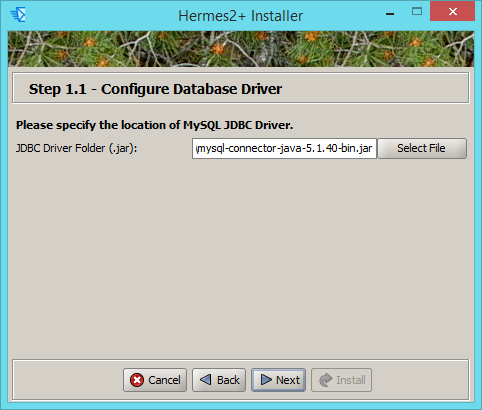 For Windows, open a command prompt as an Administrator and type java –jar hermes2_installer.jar or if java is not set in your environment path, specify the full path. Click Next until you get to Screen in 3.2 Configure Hermes. Hermes Home Folder to place the Hermes core library and system files. Click Next and press Yes if the installer prompts you to create a new folder. 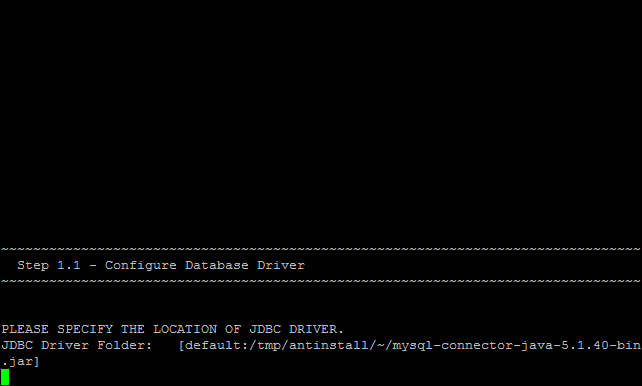 JDBC Driver Folder (.jar) Path to the downloaded JDBC driver file. Database URL The URL address of the database server. Port number may be attached to the address with the format <HOST_ADDRESS>:<PORT> where <HOST_ADDRESS> is the hostname of the database server and <PORT> is the port number listened by the database server. If you choose to re-create the tables, all of the existing data in the specified database will be removed during installation. Please backup all the data in the selected database before re-creating the tables. If you followed the steps in prerequisite Step 2 – Database Configuration above, you can just leave the settings as default value. Click Next when you have finished the configuration. If you followed the prerequisite Step 2 – Database Configuration above, you can just leave the settings as default value. Click Next when you have finished the configuration. 3.6 Click on Install and you’re done! To access the admin page, go to the following URL. The login user and password are the same as the Tomcat user with admin privileges specified in Point 3 of Prerequisite. 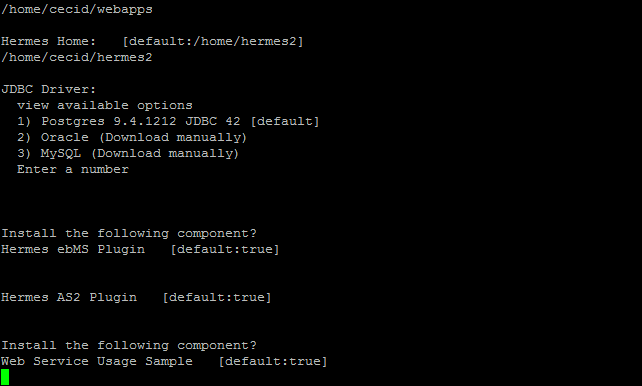 A tool kit called Web Service Usage Sample was installed under the <HERMES2_HOME>/sample folder. It contains tools to test the Hermes. config/* Contains the configuration file for the sample programs. Each folders contain related files for specific sample programs. config/ebms-partnership.xml config/as2-partnership.xml Contains partnership settings for ebMS and AS2 as the input of sample programs. lib/* The library files used by the sample programs. 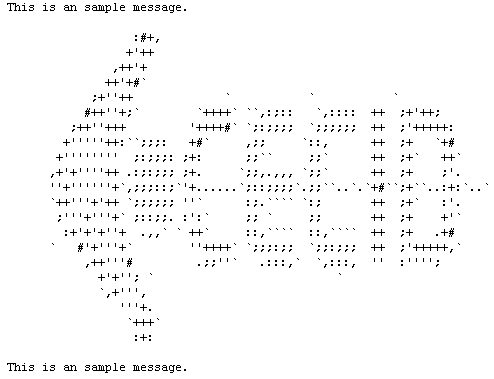 *.bat/*.sh The scripts to run the sample programs. Set environment variable JAVA_HOME to the folder where Java is located. To run the sample program, Administrator privilege or root access is required. 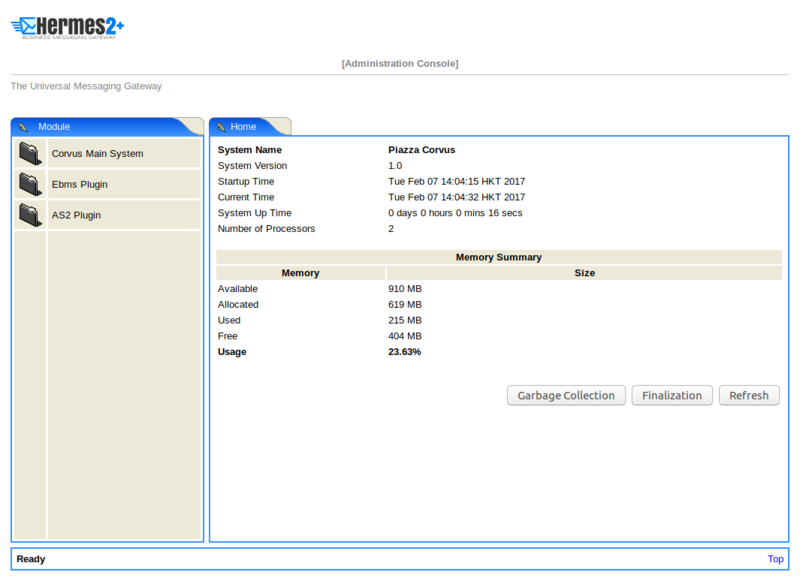 A web service sample program is provided to manage partnerships (add, update and delete). 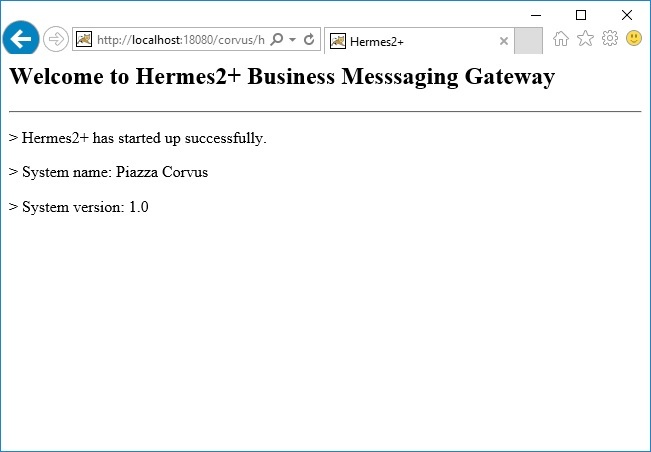 The partnership configuration for the AS2/ebMS loopback test is placed in <HERMES2_HOME>/sample/config/<as2/ebms>-partnership.xml. as2-partnership / ebms-partnership Maintains a specified AS2/ebMS partnership between sender and recipient. To perform the AS2 messaging loopback test using Steps to run AS2 Sample, you need to create the required partnership by executing the script as2-partnership. To perform the ebMS messaging loopback test using Steps to run ebMS Sample, you need to create the required partnership by executing the script ebms-partnership. 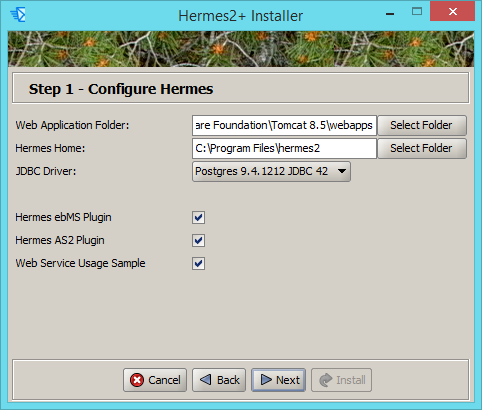 In order to validate the installation of Hermes, the following web service usage sample programs are provided. To send signed message through HTTPS, we have to configure a trust-store, keystore and certificate separately in Hermes and Tomcat. For details, please refer to the section Send Messages Through HTTPS. A1. Please ensure the Java 8 SE files have been replaced by the JCE files as mentioned in Prerequisite. 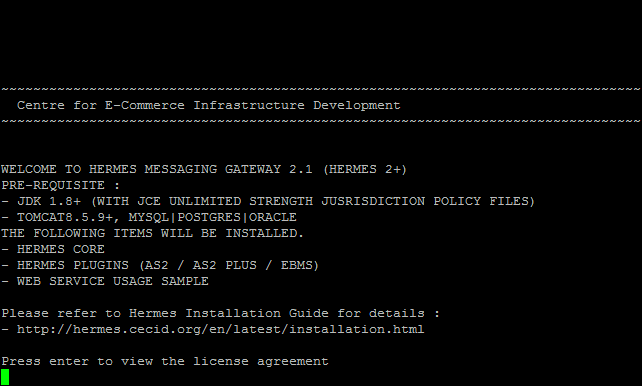 <HERMES2_HOME>/plugins/corvus-as2/conf/hk/hku/cecid/edi/as2/conf/as2.module.core.xml. There is a tag in this file named parameter with the attribute name=url. Check the value attribute to see if it references the correct server address. The format of the value attribute is the same as the JDBC connection string. 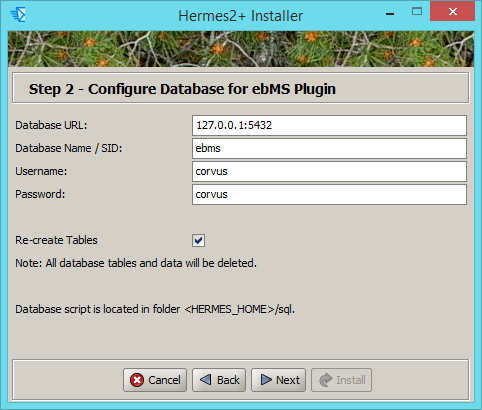 <HERMES2_HOME>/plugins/corvus-ebms/conf/hk/hku/cecid/ebms/spa/conf/ebms.module.xml. There is a tag in this file named parameter with the attribute name=url. Check the value attribute to see if it references the correct server address. The format of the value attribute is the same as the JDBC connection string. A1. It is very likely you are using an incompatible Java version. The web service usage sample requires Java 8 SE or above to run properly. In the terminal, please type java –version to check the Java version.